Blow molding is a manufacturing process used to create hollow, thin-walled plastic objects such as bottles and containers, cases and bellows. A typical blow molding process begins with a heated hollow thermoplastic tube, also known as preform or parison. The plastic tube has a hole in one end, allowing compressed air to enter. 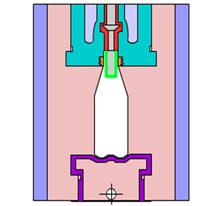 The plastic is inflated into the closed chamber of a divided mold to conform to the shape of the mold’s cavity. The molded plastic is left to cool and harden. Once released from the mold, the plastic part can be processed to have the holes rimmed or residues trimmed.